Happy Friday and thank you to everyone who entered the "Give me Jesus" and more giveaway and congratulations to Jaime W. who won the giveaway!! I wish I could give all of you a Life Lived Beautifully Journal but obviously I can't. For those of you who didn't win and still would like some help in the journaling department I wanted to share a little bit of how I journal and what Bible journaling looks like. 1. Buy a Journal ( Ah yes, this is necessary) and some good pens. I love ones that have lines and a spiral spine so I can flip over the pages easily. I tend to ramble a lot in my journaling because, heck it's just between God and I, so I like journals that will easily last me a couple of months. There are days when the words aren't flowing but it's nice to not feel limited. Here are a few that I found that were cute and not too expensive and of course the Life Lived Beautifully Journal is such a great option and on sale now for $15!! I just purchased mine!! I am a fast writer and I write in cursive when I journal because it's just more fluid and easier for me. No one else would be able to decipher my handwriting, but that's okay. I am really particular about what pens I use. I hate using pens that hinder me from writing as fast as I would like and are uncomfortable to use. I love Sharpie Pens. They don't bleed and the ink is fine and smooth. It makes such a huge difference to have a great pen. Before you get into the word and start writing, give God glory, thank him for his goodness, ask him to speak to you and edify you during the time you have. Share what's on your heart and what you are going through. Lay your requests at his feet. Of course there is no secret formula. We pray and come to God and he listens and allows us to listen as well. I know this sounds like a no brainer but sometimes it can be such a battle against our flesh, time, distractions and the devil to just open the Bible up and start reading. I always read a Psalm or Proverbs each day and go through another book or two. You don't have to read tons of chapters to hear from the Lord. Sometimes it can be just one verse that will speak volumes to you. The main thing is being open and receptive to the word of God, realizing that is alive and active. God always wants to speak to us. We just need to listen. I don't think that we always have to be reading something that is pertaining exactly to the situation we are in, but read it just as it is; the living breathing word of God and let it sink into our hearts and minds so that we can live and grow by it. Like I said, you might not feel like you are always reading something profound and directed at you, but there are those times when God is speaking directly to you through his word. Write down the scripture that impacted you. Start writing how it spoke to you and what you feel it means and how God wants you to apply it to your life. Sometimes I just write my prayers to the Lord. My mind can get easily distracted and wander so I find when I write as if I am talking to God it keeps me focused and able to clarify what is on my heart and what I want to convey to God. There are times when my heart and mind get weighed down by all the prayers that are on my heart. When I write down all my prayer requests, I feel a weight lifted. Even though God already knows them, I know that he is pleased and welcomes all my prayers and burdens as I bring them to him. I love making lists. I find this is a great way to change my attitude and perspective. If you are having a hard time finding what to write or pray start making lists. Prayer lists, thankful lists, dream lists. One of my favorite things about journaling is being able to look back and see all that God has done. It's so easy to forget all the prayers that have been answered and the heart work that has been accomplished. It might have taken place over the course of years and years of prayer and perseverance but it's great to have such a tangible reminder( provided you can read what you wrote) of all that God has done in your life through the years. Sometimes I squeeze in a few verses as I sip my cold coffee amidst the leftovers of breakfast, while my kids are calling my name way more than I would like. Sometimes I hear God speak a verse to my heart as I am doing dishes or sweeping for the 30th time in a day. Sometimes my husband is working late and at least a few of the kids are asleep and I am able to sneak away(to my bedroom) and enjoy a few moments to pour out my heart to the Lord. Sometimes I go running and worship and pray as I run. Sometimes I get up early and after a few minutes of quiet I hear little footsteps pattering towards me. No matter what the scenario God's grace is there for me and for you. I never want to stop seeking to get away with him in the quiet place, behind closed doors, or out somewhere by myself. But most days I am learning to seek him in the chaos and the noise as well. I am learning to ask him to teach me and speak to me as I go about my day and to be mindful that he is able to speak to me even when I don't have the perfect quiet time. I lose my train of thought easily so I am happy when I am able to sit and write down what God has spoken to me through his word so I don't forget! 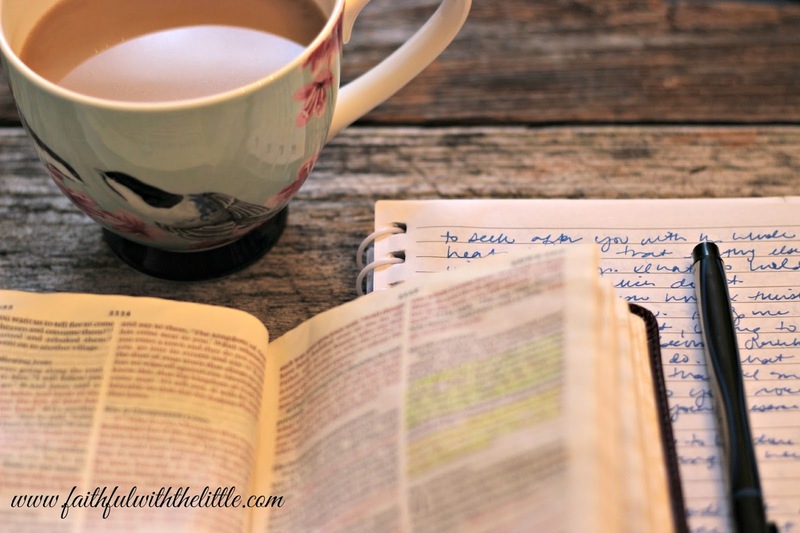 I never planned on sharing about Bible journaling, it somehow came about. I am not an expert on the Bible or how to spend time with the Lord but I am just like you; desiring to be faithful in my prayer time and with this great life manuel that we have been given. My personal relationship with the Lord is just that personal; between Jesus and I, but I do pray that out of it God can work and use me to encourage you. The way you communicate with the Lord might be entirely different from how I do and that's okay, as long as we are seeking him! Do you Bible journal? What do you like about journaling? How has it changed how you read the Bible and spend time with God? Are you just starting out? What are you hoping to accomplish through it? I love that you are finding a way to journal in the midst of the chaos. Like you, I journal while I can. I'm glad that you added part 5 about listening for God even when you are busy. God can use any situation if we just pay attention! 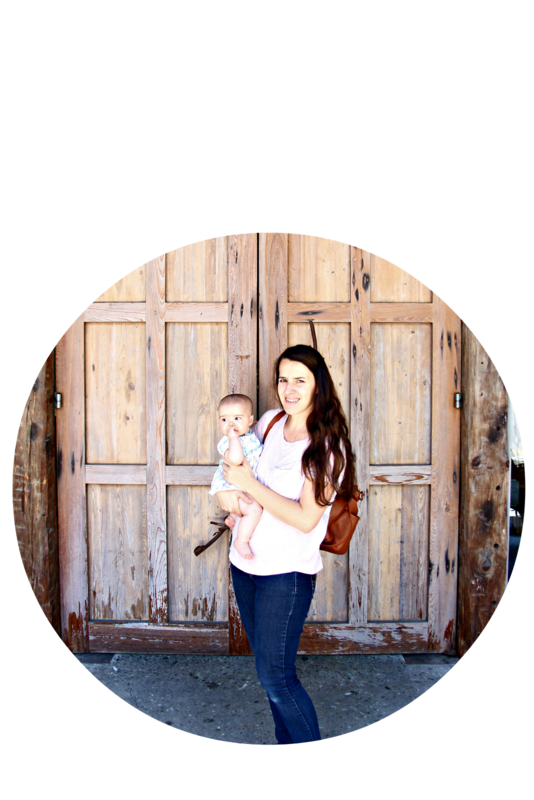 I'm stopping by from the Missional Women blog hop! It was great to visit your blog! I keep a spiritual journal too. Mostly I write down my prayers and what God is speaking to me, the Bible verse he uses to do so etc. It keeps me grounded. It enables me to extend my time with God. Thanks, neighbor, for such a great post! Yes, journaling is such a great extension of our time with the Lord! I have stopped journaling and I know being busy is no excuse. I should start again. Rebekah, that picture at the top just makes me want to jump right in! I've wanted to do more journaling, but often wondered where to start. Thanks for giving us a bit of a blueprint here. Of course there's no perfect formula, but i's so helpful to have a place to start. Thank you! Aww...glad you found it helpful! I hate writing, but found I love journaling and talking with God! It is so wonderful. I started a new business, and started journaling as part of the "journey". Like you mentioned, I often journal about ways that God is faithful and answers prayers or just walks along side me. Thank you for your message. Visiting today from Holley's link-up. I tried Bible journaling for the first time on a faith and art retreat in Italy this summer. I'm not really an artist or a doodler but I was surprised that I enjoyed it! Enjoyed your post too! Oh wow, how cool! Yeah, its a great outlet! I should start doing this. Thanks Tai! Yes, I've seen those. I always want to write in my Bible but then I end up using my writing and hifhlighting as kind of landmarks in my Bible and I'm trying to memorize where the scriptures are without my markings but I should give those a try. Thanks! I love journaling. Now, though my journal is transferred to my blog. I write and study at the same time. A lot of my writing ends up on my blog. Thanks for sharing on Literacy Musing Mondays. Bible Journaling has been such an inspiration to me to get in the Word and is so much fun to be creative! Thank you for sharing! Your blog design is Lovely!